November cometh. 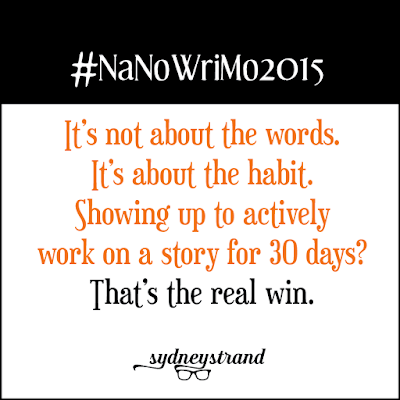 With it cometh NaNoWriMo. The best month of the writer's year! And no, in my opinion, you do NOT need to be fast-drafting a First Draft. You can do what I'm doing: revising. Am I cheating? Uh, how is working on a book, in whatever draft, cheating? 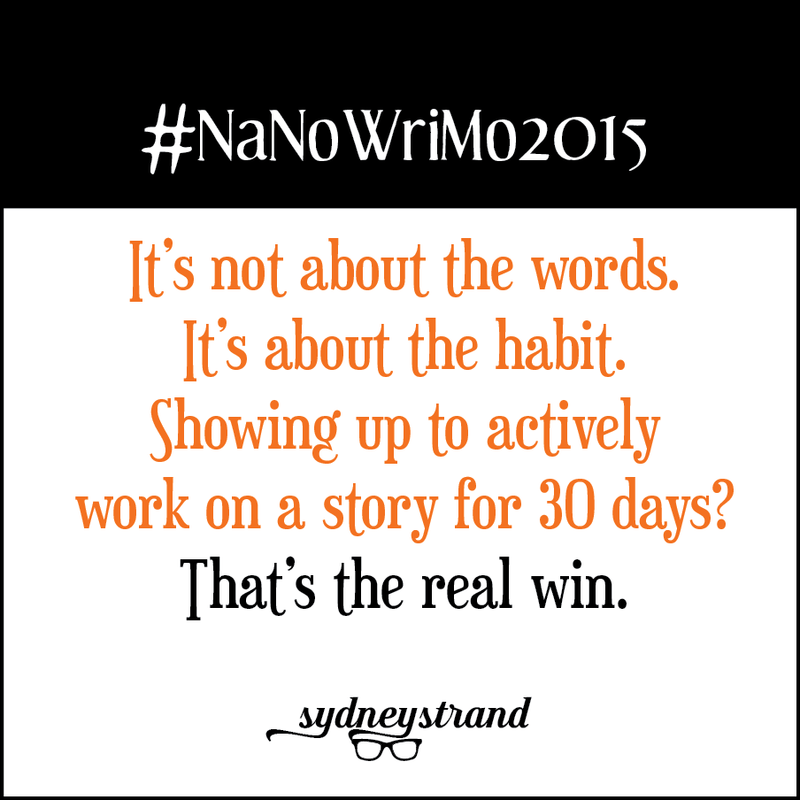 And I'm not giving up the awesome camaraderie of NaNoWriMo just because I'm ahead of the curve. Because I like to banter with fellow tortured souls. I do it on Twitter (sydney_strand), Facebook (sydneystrandauthor), and Instragram (sydneystrand). Come find me! Friend me! Offer me psychological help when I need it! I am printing out the manuscript, separating it by chapter, and stapling each chapter as a separate entity. I am interviewing my story one more time. You can find that interview here. I am creating a checklist of the answers/my random notes to have by my side as I attack this Final Draft. NOTE: The story is already set to go in Scrivener, all 63 Chapters. I am revising 5 chapters per day through Chapter 47. Chapters 48-63 are Draft 2 stuff. That's 16 chapters of slow muck. I can do 3 chapters per day. I need to revise Chapters 48-63, aka, Act III once more. The muck will be gone, but the idiocy of illogical thoughts and stilted transition will still be there. I can do 3 chapters per day again. I will compile the story (remember, it's in Scrivener) into MOBI format and read it on my Kindle app on iPad. This is the "real book" stage. I will only highlight the issues--character inconsistency, plot hole, forgotten threads, spelling if it's glaring (but I won't be actively looking yet). I will revise the story based on those highlights. I will revise approximately 15 chapters per day. Turn the Scrivener file into a Word file. The act of formatting helps me find a LOT. Read one more time for issues. Read it in one sitting, on my Adobe Reader app. It's ready to leave the nest. And the next story awaits.